If the server is installed in a rack with extendable slide rails, use this procedure to extend the server to the maintenance position. (Optional) Use the set /SYS/LOCATE command from the -> prompt to locate the system that requires maintenance. Once you have located the server, press the Locator LED and button to turn it off. 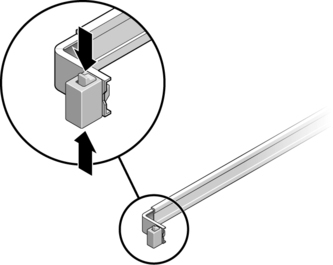 From the front of the server, release the two slide release latches, as shown in the following figure.